Given the ongoing revelations on the extent of Tony Blair’s duplicitous collusion in the illegal bombing and invasion of Iraq, it seems – to muddle metaphors – the “bunker busters” and Cruise missiles are finally coming home to roost. 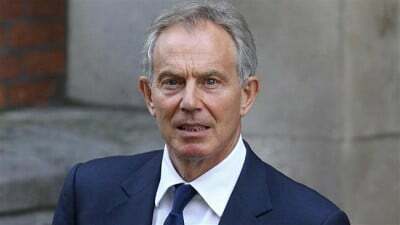 In what has been dubbed “an apology” Blair even took to CNN in an interview with his pal Fareed Zakaria to – sort of – explain himself. It was no “apology”, but a weasel worded damage limitation exercise as more and more revelations as to disregard for law – and to hell with public opinion – surface. The fault was that “… the intelligence we received was wrong”, there were “mistakes in planning” and a failure to understand: “what would happen once you removed the regime”, said Mr. Tony. Statements entirely untrue. It is also now known he plotted with George W Bush in April 2002, a year before the onslaught, to invade, come what may. He also found it: “hard to apologise for removing Saddam.” Sorry Mr. Blair, the all was lawless, illegitimate and criminal – and Saddam Hussein was not “removed”, he was lynched, his sons and fifteen year old grandson extra-judicially slaughtered in a hail of US bullets – the all in a country whose “sovereignty and territorial integrity” was guaranteed by the UN. Whatever opinions of the former Iraqi government, the crimes committed by the US-UK war of aggression and aftermath, make the worst excesses of which Saddam Hussein’s Administration were accused pale by comparison. 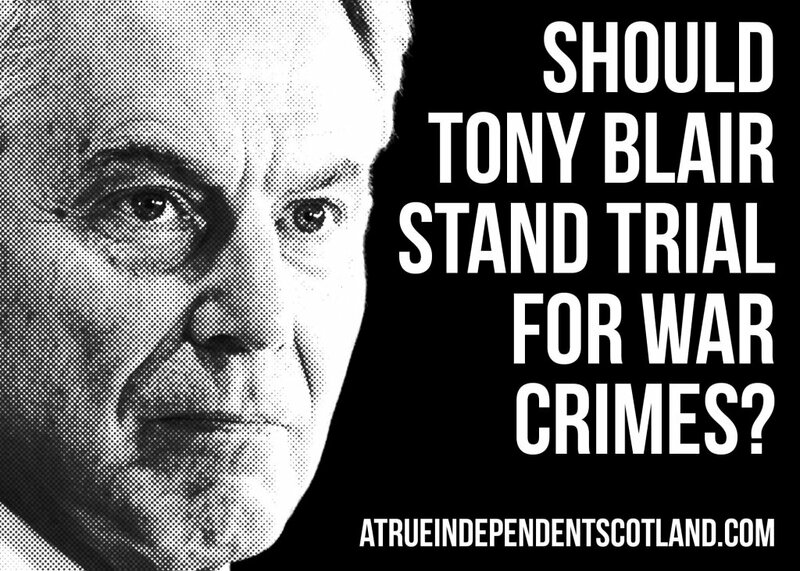 Blair brushed off the mention of a war crimes trial and made it clear that he would trash Syria as Iraq, had he the chance. To this barrister (attorney) by training, legality is clearly inconsequential. 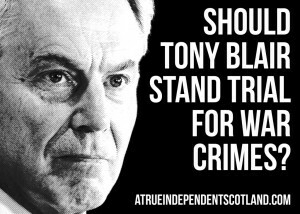 Now no less than the UK’s former Director of Public Prosecutions (2003-2008) Sir Ken Macdonald has weighed in against Blair. 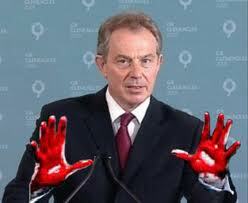 That he held the post for five years during the Blair regime (Blair resigned in 2007) makes his onslaught interesting. Ironically Macdonald has his legal practice at London’s Matrix Chambers, which he founded with Blair’s barrister wife Cherie, who also continues to practice from Matrix Chambers. Macdonald cuttingly cited Blair’s: “sycophancy towards power” being unable to resist the “glamour” he attracted in Washington. “Since those sorry days we have frequently heard him repeating the self-regarding mantra that ‘hand on heart, I only did what I thought was right’. But this is a narcissist’s defence, and self-belief is no answer to misjudgment: it is certainly no answer to death.” No wonder Sir Ken had headed the country’s legal prosecuting service. 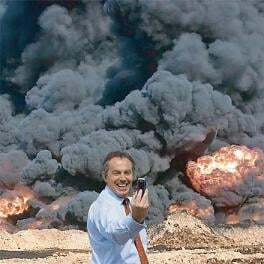 There was “pandemonium”, Blair was “horrified” and the limited number of Ministers and officials who had a copy of the written opinion “were told ‘burn it, destroy it’ “ alleges the Mail. The US of course stole and destroyed or redacted most of the around 12,000 pages of Iraq’s accounting for their near non-existent weapons, delivered to the UN on 7th December 2002 and Blair seemingly faithfully obeyed his Master’s voice or actions. In context of the lies and subterfuge of enormity being told both sides of the Atlantic at the time, it is worth remembering George W. Bush, that same December, on the eve of a NATO summit, addressing students and comparing the challenge of the Iraqi President to the Nazi invasion of Czechoslovakia in 1938, which led to World War II. We face … perils we’ve never seen before. They’re just as dangerous as those perils that your fathers and mothers and grandfathers and grandmothers faced. Thus he would, seemingly, have concocted a different set of lies to justify the assassination of a sovereign head of State. … it’s increasingly serious enough to be worrying to him. And I think Tony Blair is rapidly joining Henry Kissinger and Chilean Dictator Augusto Pinochet and other people around the world. Now, he’s got to consult international lawyers as well as travel agents, before he travels anywhere, because there’s said, (may be) prima facie case for his prosecution either in British courts or foreign courts under universal jurisdiction or with the International Criminal Court, because there is clear evidence now that he is somebody who waged an illegal war of aggression, violating United Nations’ Charter and was responsible for all of those deaths. 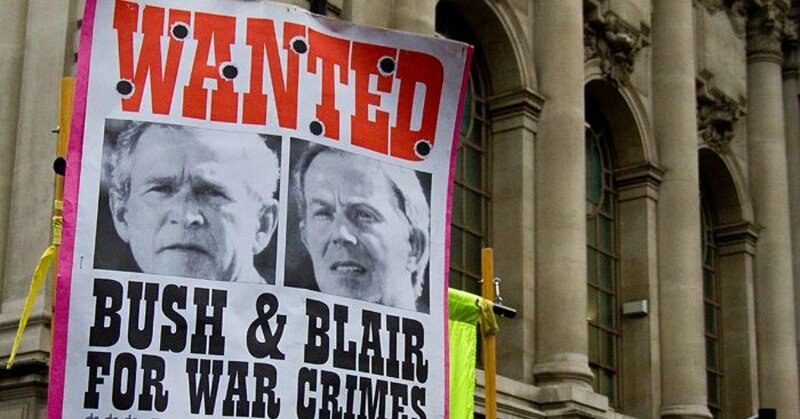 Justice, inadequate as it might be given the enormity of the crime, may be finally edging closer for the people of Iraq as international jurisprudence slowly encroaches on Tony Blair.